The very words just shout “Fall”, don’t they? you are going to be in a happy place. gave me reason for pause. No one likes to waste time and ingredients! Monica at The Yummy Life. Her Caramel Apples are lovely, really just beautiful. I figured I would give it a go. The project was a success! It was really a lot of fun. I bet some of you would like to make them as well. It is fall after all…. and a beautiful golden fall it has been here in Utah. My girls picked 10 tomatoes out of my garden just this morning…who could believe we are almost to the end of October! 1. Wash your apples, and wash them well. Rub your fingers roughly all over the tops to get any of the waxy coating off. 2. Push your sticks into the center of your apples and put them in the freezer. Yes. The freezer. Leave them there, cold and lonely, for 40 minutes. 3. Unwrap your caramels. Put them in a medium sized sauce pan with the water and vanilla. Turn the heat to medium and let the caramels melt. Stir them often. You don’t want them burning to the bottom of your pan. 4. Dip each apple into the caramel. It will begin to set up pretty quickly. Turn them upside down for just a bit so the bottom part can start to set. Just 20 seconds or so will do fine. Place the apple on a piece of tin foil that has been sprayed with cooking spray. Wax paper, is not your friend here. The caramel will stick all over it. 5. If you want to dip some of your caramel apples in nuts instead of chocolate, this would be the time to do so. Just roll them around a bit to cover the bottom of your apple. Or, if are totally nuts about nuts…. roll them all over your apple. You are the creator of your destiny here. Freedom of choice is a wonderful thing. 6. Place the caramel apples in the refrigerator to continue setting up, while you work on melting the chocolate. 7. Put each bag of chocolate in a glass measuring cup. The 2 C size works really well. Melt the chips in the microwave for 30 seconds at a time stirring after each cooking interval. Don’t get the chocolate too hot, here. See the picture above. Some of the chips will still look like chips, but will melt easily by stirring. Add 1 t shortening to each of your chocolate mixtures and stir to incorporate. 8. Grab your apples out of the fridge. Take each apple and mold the bottom of it with your hand. Dip the apples into the chocolate. Hold the apple above the chocolate container to allow excess chocolate to drip off. After the apple has been dipped you can also take a butter knife and spread the chocolate around the apple, allowing the excess to drip off into your chocolate container. 9. Set the dipped apple back on the sprayed tin foil to set up. 10. 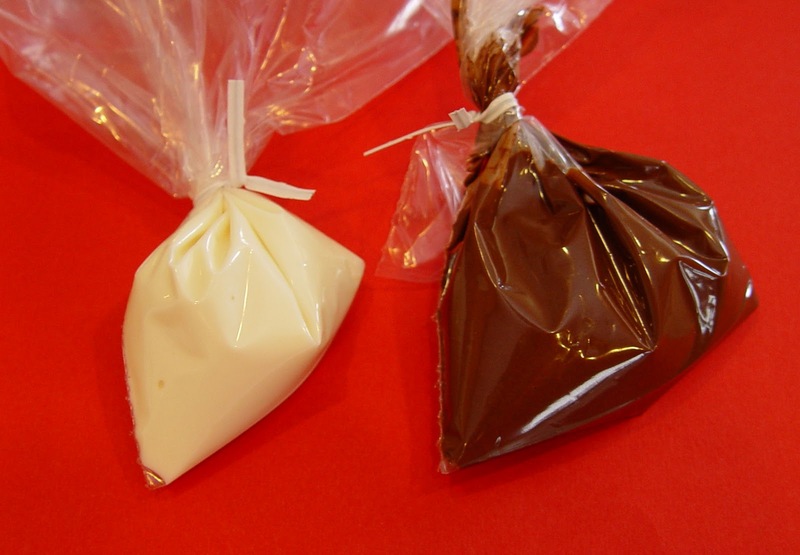 Take the chocolate left over from dipping and place it in Ziploc bags. Clip the end of the bag and and drizzle the chocolate over the tops of the apples. Sprinkle with nuts, if desired. 11. Place them back in the fridge to finish setting up. It should only take about 20 minutes for the chocolate to be totally set up. Enjoy! These will keep well in the fridge for up to 5 days….if they last that long! I can’t wait to make them again. They would make a great gift. 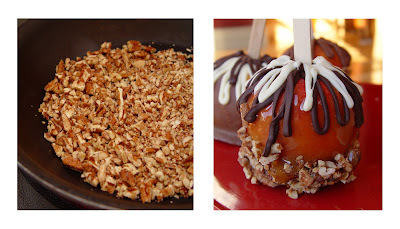 Check out Monica’s post, for ideas far beyond just dipping the caramel apples in chocolate. 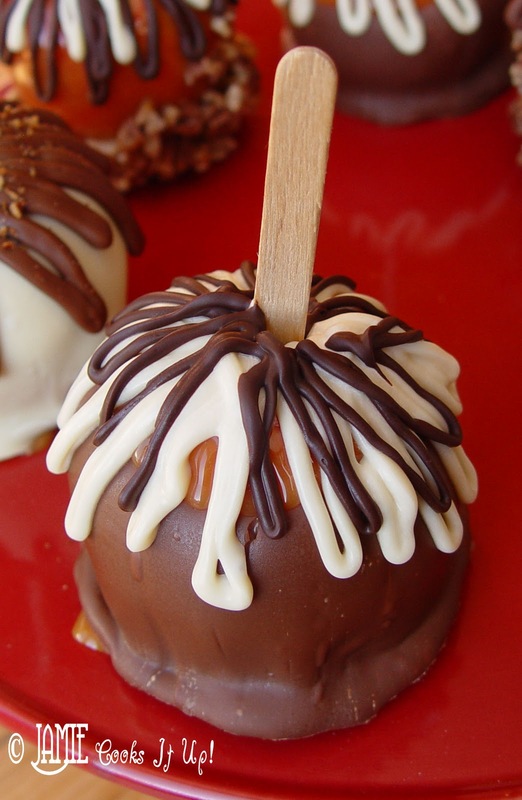 She’s got clever Caramel Apples over there. Those look so pretty Jamie. Almost to pretty to eat, but just almost. he played in a pop group. ???????? : ?? ?????? ? ???-?????? ( ? ?? ?????!)2. have/has got ??? ???????? ? ????????? ???? ???????? ?? had gotThey said We’ve got a new flat’. ->They said they had got a new flat.John said My wife hasn’t got a car’. ->John said his wife hadn’t got a car. These apples look perfect. I wish I could have just one! Your apples look beautiful! Great idea to put the melted chocolate in plastic bags for drizzling. That's easy and something everyone has in their kitchen. Love your blog–both the content and the “look”. Those apples look amazing! I just might have to give them a try. 🙂 You have a very nice blog, and I love your pictures!! These look beautiful AND delicious!! I will most definitely be giving them a try. P.S. Have you ever dipped pretzel sticks in caramel and chocolate? I never have and am wondering if this is the way to do that as well. Thanks Jamie!! These look amazing! Great job 🙂 You might be able to get me to eat an apple after-all! WOW, these look amazing! Can't wait to give them a try. I do pretzel rods for X-Mas gifts and they are fun to do as well. What fabulous photos you posted. I especially like the one of the apple taking a shower in the sink!!! So my husband reads your blog all the time while he is at work. Funny huh? He loves food (watches the food network all the time) He was telling me about this post and we are gonna give these a whirl when he gets home from work tonight. I doubt they will be nearly as pretty as yours though! Thanks for all the great recipes and my husband's reading enjoyment! 🙂 Love you Jamie! OMGosh, Jamie, just read the post about your boys' b-day cakes. Love the cakes, SO CUTE! I am dying over the naked news! DY-ING! too funny, and a little sad…glad you have the food network now though 🙂 we love that channel, and TLC w/ the cake boss and everything. also, too funny about the cupcakes. Love that the boys were not letting you get away w/ out making them a big cake. I sat w/ them at the primary program practice the other day, they are such CUTIE pies! Melt my heart cute. I haven't ever tried dipping pretzels in caramel. My guess it it would work well with this method. If you try it let me know how it goes! We made these on a rainy Saturday afternoon and they turned out awesome. We tried all kinds of yummy combinations. (we tried using peanut butter chips too – it doesn't melt and spread as well as the chocolate, but it tastes great!) And the best thing is, ALL my kids could help and loved it. I just wanted to let you know that my husband was in HEAVEN when he ate these. Thank you for the detailed instructions. I made it the first time and they turned out perfect! Is the little “t” teaspoon and big “T” tablespoon? Yes you are correct. The little t means teaspoon and the big T means Tablespoon. 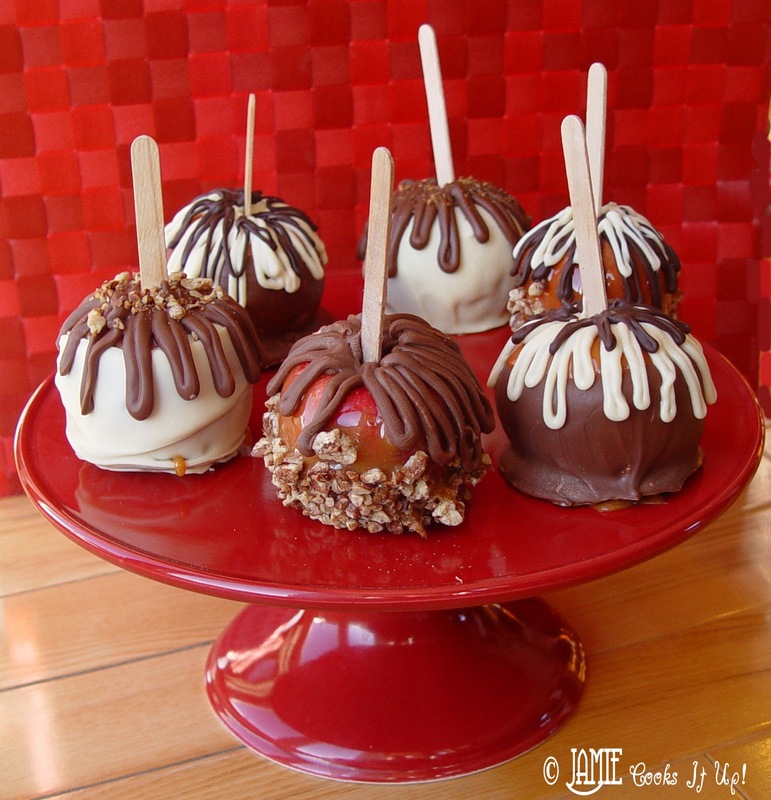 My kids really love this idea of dipping the apples in their favorite chocolate and caramel!